Want to be light on you feet? Why not put the lightness on your feet? 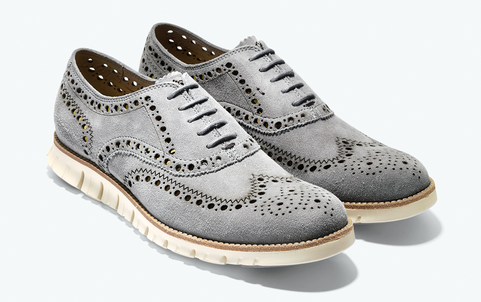 Cole Haan has launched a new collection of shoes called ZeroGrand, a group of super lightweight brogues. These shoes are remarkably agile and the craftsmanship together with the comfort seek to move men forward fashionably toward a new paradigm of mens footwear. The ZeroGrand collection is available now on ColeHaan.com and at Cole Haan stores in Tokyo, Japan and throughout the US. Check out the video below then see the full ZeroGrand collection HERE at Cole Haan's website. ZeroGrand Oxford No Stitch ($248.00) - The lightest and most flexible shoe Cole Haan has ever created. Functional brogue detailing decreases weight and provides breathability. The ripstop nylon upper pieces of the Oxford are bonded to each other using high frequency welding, reducing the number of components on the shoe. ZeroGrand Wing Oxford ($268.00) - The Wing Oxford is one of the lightest weight casual shoes to hit the market. It is made of reverse full-grain suede, that has been laser treated to add pinking and decorative stitch details. A Strobel stitch construction (upper suede is stitched to the insole) offers more strength and flexibility than other techniques. The natural storm welt with break and flex grooves provide for increased flexibility. 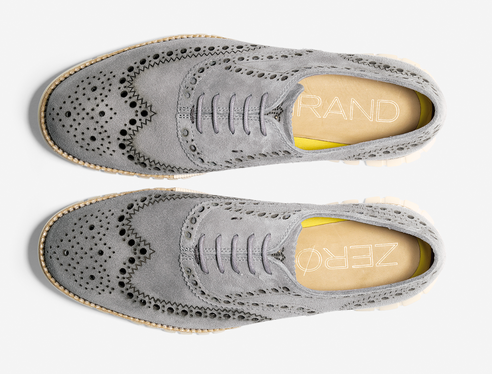 Included in both Oxford designs is “functional broguing,” a perforation detail shown on the toe medallion and upper portion of the shoes. Perforations are laser cut for ventilation, weight relief and flexibility. Modern brogues trace their roots to a rudimentary shoe originating in Scotland and Ireland that was constructed using untanned hide with perforations, allowing water to drain when crossing wet terrain, such as the Scottish bogs. ZeroGrand Tall Boot ($298.00/Available 10/1) - The ZeroGrand Tall Boot is a casual lace-up boot. The rubber heel and toe pods increase durability and a break in the welt and flex grooves increase flexibility.